By LUDWIG VON KOOPA - Let's rate all the downloadable characters added after the game's release! 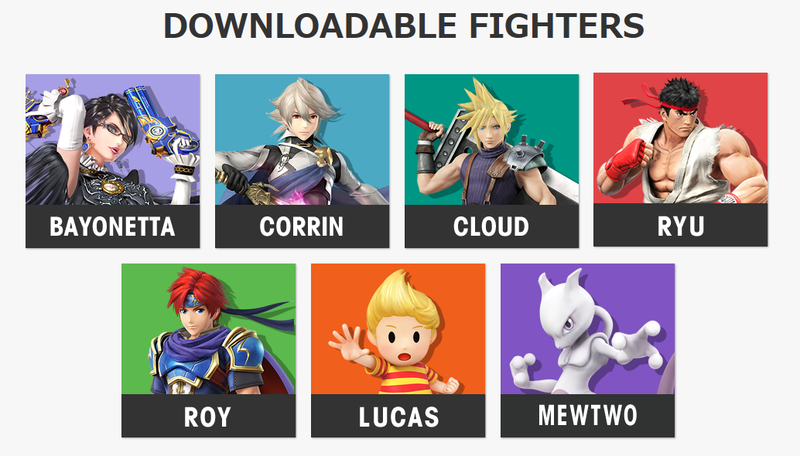 Bayonetta, Corrin, Cloud, Ryu, Roy, Lucas, and Mewtwo. That's from newest to oldest. This article will go the other way. I'll be employing the same criteria for the ratings and they'll work the same way as last time. Even better, since I saved the Excel sheet for the first iteration of this article, I'll share the NEW standings at the end! Relevant KoopaTV article(s): (Round 4 and Finals) Ludwig's Character Battle IX Votes! and KoopaTV's Live Reactions To Smash Wii U's 50-Fact Extravaganza! and Mewtwo Strikes Back... Against the IRS! Thoughts on the character before reveal: I didn't think there would be any DLC characters. There was Mewtwo. This was the start of our demise. Mewtwo was a has-been from Super Smash Bros. Melee where he was a complete disgrace. 2/10. Thoughts on the trailer: Now, of course we realise from here on out that there will be no CGI stuff in the trailer like the trailers for the characters originally in the game. DLC isn't worth contracting these studios to make trailers! The closest thing is that eye thing at the start. Anyway, it was still well-done for all in-game stuff, and the Genesect thing referenced Genesect's movie. But no grudge match vs. Lucario? 6/10. Thoughts on the character based on trailer: Mewtwo still has this Super Smash Bros. Melee moveset? SO HE'S STILL A LOSER. 2/10. Thoughts on the character after the game came out: Mewtwo is better than in Super Smash Bros. Melee but... he's still a loser. He's huge and a lightweight. His up-smash is really cool and he beat some IRS thugs for me, but he's not worth buying. Good thing we got him for free from Club Nintendo. 4/10. Relevant KoopaTV article(s): KoopaTV's April 1 2015 Nintendo Direct LIVE REACTIONS! and There is Post-Mewtwo DLC. Ludwig apologises. Thoughts on the character before reveal: I referred to Lucas as "Pukeass" very consistently while everyone still played Super Smash Bros. Brawl, and even after. Of course, I've never played MOTHER 3, but I heard his portrayal in Subspace Emissary is pretty spot-on. He's a dweeb, though I drew fan-art of him as a request for a Lucas fan. Still... 1/10. Thoughts on the trailer: Lucas literally assaulted King Dad for trying to help Ness. What a smug dot-faced JERK. Though I do like the whole Claus and Masked Man thing going on. I also like that Lucas is paying Ness back for everything Ness did for him in Subspace Emissary. 5/10. Thoughts on the character based on trailer: Same loser from Super Smash Bros. Brawl. With a meteor smash, I guess. 3/10. Thoughts on the character after the game came out: I never actually bought Lucas. He's much easier to fight against than Ness, though? 5.5/10. Relevant KoopaTV article(s): KoopaTV's "Super Smash Bros. - New Content Approaching" Live Reactions! and When Is Marth Going To Learn English? Thoughts on the character before reveal: Roy is a complete failure who was used by pyromaniacs who like swords back in Super Smash Bros. Melee. He's also one of the worst Lords in the series in Fire Emblem: Binding Blade. Overrated trash, who I maintained should NEVER return to a future game. Also shares the name of one of my brothers. 1/10. Thoughts on the trailer: The music is cool... but it's not like it's new or anything, it was already in the game. The best part of the trailer is the part before Roy actually appears. "Don't forget about me!" Is something an irrelevant loser would say. Roy is to Fire Emblem characters as Jeb Bush is to Republican presidential candidates. 3/10. Thoughts on the character based on trailer: He's still a clone of Marth! Plus he hates my brother just for having his name. HE ALSO DOESN'T KNOW ENGLISH, just like Marth doesn't. (At least there's sub-titles.) He's probably a terrorist taking advantage of the immigration system, and his style is still woo-ing people with fire. 2/10. Thoughts on the character after the game came out: I also did not buy Roy. Roy players are easy to fight, since they're naturally losers. Roy thinks he's pretty hot with his non-clone jab move where he swings his sword unnaturally. He's trying too hard. Get out of the game. Fire Emblem has way too many characters as it is, and if there is going to be another one, have it be Micaiah. 2/10. Relevant KoopaTV article(s): KoopaTV's "Super Smash Bros. - New Content Approaching" Live Reactions! and KoopaTV's Nintendo World Championships Live Reactions! Thoughts on the character before reveal: Ryu is from CAPCOM. My vote was for Phoenix Wright, but Ryu proved you could be a third party and contribute multiple characters. I was never thrilled about Ryu or Street Fighter, but nothing against him. 6/10. Thoughts on the trailer: There are actually some special effects in here! Maybe CAPCOM paid for them. Ryu obliterates the plumber in a high-intensity awesome-to-watch trailer filled with cool combos. 8.5/10. Thoughts on the character based on trailer: Wow! Ryu looked really awesome! Reggie Fils-Aime played as Ryu after this trailer came out and was a total fraud, but I'm not taking that against Ryu. It looks like he serves a big contrast between Super Smash Bros. and how Street Fighter works. 9/10. Thoughts on the character after the game came out: Ryu impressed me so much that I bought his DLC and got a stage as well. He's way too complicated and advanced for me to do well with — highest skill floor of anyone else on the cast, I think. But watching other players play with him is a joy, and I still like his theme. If I wanted to learn Ryu really well, I'd study Street Fighter, since his inputs for his special moves are the same between the two games. 7.5/10. Relevant KoopaTV article(s): Who Ludwig is Voting For in Character Battle IX (Round 1) and Ludwig's Nintendo Direct November 12 2015 Live Reactions! and Was the November 2015 Nintendo Direct THAT Mind-Blowing? and KoopaTV's FINAL Smash Direct Live Reactions! Thoughts on the character before reveal: Everyone on every Internet forum had to see a thread wanting Cloud in the Super Smash Bros. series at some point. I always thought that Crono from Chrono Trigger should be the Square Enix representative, if there would be one. I also voted against Cloud in every match he was in for the GameFAQs Character Battle IX, voting the likes of Prinny over him. 2.5/10. Thoughts on the trailer: I exploded in the live reaction. Square Enix also funded some CGI for this! Not much, but there's something in the introduction. Everything in the first minute is totally amazing and hype-building. The trailer shows Cloud destroying people with his Buster Sword, and also shows his stage. Great actions-to-music too. Got that SQUARE ENIX CO. added to the bottom of the company credits at the end, which was cute. 9.5/10. Thoughts on the character based on trailer: We didn't know how the Limit Break system worked, so we just saw Cloud doing all these super cool moves and we didn't know how. But he looked flashy AND impressive. (As opposed to Roy, who was just flashy.) Not going to lie, though — can't help but think he's just another sword user. 7/10. Thoughts on the character after the game came out: Remind me why Ike couldn't have a projectile like he does in Fire Emblem: Path of Radiance and Fire Emblem: Radiant Dawn? Cloud has one and it works like Ike's would. The Limit Break basically makes Cloud an improved Little Mac, who might be a failed character in practice. (Sadly.) Obviously, I did buy Cloud because I was impressed by his trailer. He's fun to play with, and you don't need that much skill to do cool-looking things with him. I recommend you buy him too, and he comes with Midgar. If you win 2nd place in the KoopaTV Loyalty Rewards Program for Round 6 (ending in 10 days), you can win a Cloud code for the 3DS! 8/10. Thoughts on the character before reveal: I first heard the name Corrin from the Fire Emblem Fates E3 Treehouse Live session. I didn't think anything of him then, other than that he looked overpowered in the gameplay. I then forgot the name a week later when writing about Fire Emblem Fates and kept using the term "customisable character" to describe potential non-traditional relationships the player can pursue through their avatar. Afterwards, I totally forgot what Corrin even looked like, so I didn't even know who the hell it was in the trailer. I didn't even recognise it from Rawk's article about female Corrin having two left feet. Completely unrecognisable and boring. 1.5/10. Thoughts on the trailer: Is this CGI made for the trailer? Or is it from Fire Emblem Fates? Who is that horribly-designed purple-haired woman in the intro? Who are these people and why are they annoying?! "We're your family." That dude is acting like a stranger with candy in a car. Obviously, "Join the battle in Smash" is original to the trailer. "You're battling completely unknown opponents!" Is that supposed to be a reason that Corrin shouldn't have joined Smash? Does Corrin know every single person in Fire Emblem Fates already? So the "warriors of the Outrealms" now includes Roy, huh? "Big brother's now big sister!" "WOOOOOW even better!" Freaks, no wonder Corrin wants to get away from these people. If the trailer was supposed to sell Corrin, I think it succeeded even more in getting people not wanting to touch Fire Emblem Fates. 1/10. Thoughts on the character based on trailer: Well, Corrin is the big brother of a lot of people, and he has a big brother as well. Corrin seems as lame as Chrom. I never liked Corrin's collar armour thing. Corrin also apologises to the creeps from Fire Emblem Fates that made the trailer score so low, so he's showing himself to be a loser. I didn't pay any thought to the whole dragon body thing, because who cares? But that's the character's whole gimmick. Whoever this Corrin guy is, he hates shoes. 1/10. Thoughts on the character after the game came out: If the character's selling point is a gimmick, and I don't care about the gimmick, then I probably won't care about the character. I didn't buy Corrin, but I've watched his gameplay and such. It doesn't feel like, “Oh, Corrin's arm turned into a dragon! SO COOL.” It feels like, “Corrin summoned a big spear from hammerspace and stabbed someone with it.” or “Corrin got some sort of charging biting blaster like Wolf's B move to shoot someone from hammerspace.” I'm seriously bothered by six Fire Emblem characters, and Corrin is the new Roy in that it's a Fire Emblem game being promoted before it's out. Corrin is possibly a child molester in the Japanese version of Fire Emblem Fates as well, but thankfully that doesn't seem to be an issue in the localised version. (I've been asked to write about that — and I will, after it comes out tomorrow.) Still, Corrin is wholly not compelling. He's a sword character with dragon parts that function as swords in terms of being disjointed hitboxes. 1.5/10. Thoughts on the character before reveal: I didn't even know Bayonetta was a contender for the Smash Ballot. Anyway, I didn't care for Bayonetta 2, though I have always liked Bayonetta's music. Still, she didn't even come up in my “discussion” of attractive dominant female characters. I voted N over her on GameFAQs, which is pretty indicative how I think of her. She wasn't on my radar. 3/10. Thoughts on the trailer: I thought at first the trailer was going to be for another Kid Icarus character, which would be Sakurai trolling the fanbase even more than a sixth Fire Emblem character did. But then, bam, Bayonetta! The trailer is told from the perspective of Pit and Lady Palutena, which makes sense given Bayonetta's animosity towards angels. Dark Pit showing up was surprising too, since I actually forgot he was in the game. Anyway, the trailer didn't really inspire much — unlike Ryu's or Cloud's, which were awesome and intense. The trailer should've had some adrenaline, particularly since Bayonetta is from an action game. 5.5/10. Thoughts on the character based on trailer: I wasn't mad she won the Smash Ballot. Better than a lot of other options. (Obviously not as good as Phoenix Wright.) I thought the Wicked Weaves limbs sort of look like Hades from Kid Icarus: Uprising. Anyway, happy that Bayonetta has both designs from Bayonetta and Bayonetta 2. The trailer didn't really give me much care, but in the same Direct, Sakurai proceeded to talk more in-depth about Bayonetta and her combo-ing. That was cool, I guess. I could see she wouldn't be my kind of character, but she could be really fun to watch. 7/10. Thoughts on the character after the game came out: Obviously I bought the Bayonetta + stage DLC, or else the screenshots in the Give a Warm Welcome article and its Miiverse thread companion wouldn't exist. I gave the 3DS code to a very good friend for her birthday and I hope she likes Bayonetta as a Super Smash Bros. character more than I do. Bayonetta isn't easy to use at all, and you kind of need to focus with her to pull cool stuff off. I actually think she has less potential for cool combos than Ryu does, which is probably a problem. This doesn't count combos started by Witch Time. Her frame data is a lot worse than Ryu's. That said, I like her pummel — a quick slap across the face, and she's sexier than I initially gave her credit for. ...Anyway. 6/10. Handy graphic that sums up the whole article. The seven downloadable content characters are in red! If Dr. Mario and Dark Pit were on here, they'd be on the lower half. But they didn't get trailers. It looks like the downloadable characters didn't end up being a spectacular addition to Super Smash Bros. 4 as a whole, and that is pretty consistent with my opinions throughout this whole process. (That said, part of the reason for that is the trailer scores for the DLC guys are much lower on average — you can bet the lack of animated non-in-game sequences is a cause.) Sakurai is clearly creatively exhausted from this. Hopefully we can move on from being singularly focused on DLC, and we can still enjoy the game as a completed product. This article exists because of a request submitted by a reader! Ludwig thanks the reader for that request, since this article as a sequel was sorely needed. YOU can submit requests, too, by commenting on the Submit Requests page with what you want to see! Ludwig's most played newcomer is still himself, and he believes he has authority to pass judgment on other Super Smash Bros. fighters as a fighter. Ludwig wished he was higher tier in terms of skill, however. Cloud & Ryu are my favourites, yeah. Dark Pit was in her trailer, but not as a character announcement. I thought I was super-smart back then for thinking he'd be a stage boss (ala Yellow Devil or Ridley) for the Palutena's Temple stage. We saw from the other trailers that every character in a trailer is going to show up in the game somehow, like Yellow Devil. I just didn't think he'd be a playable character — same situation with Yellow Devil. I used Lucas back in the Brawl days but barely touched his DLC at all. None of the DLC really captures my interest. WOuld have like some DLC of the cephalopod kind or of the Wars of the Advance kind (I refuse to type it as "Advanced" even if that may make it more grammatically correct, I get annoyed at people not correctly typing out the name of that series just as how annoyed I get when people do not spell correctly my real life name). Yeah, I never used Lucas in Brawl. So you bought his DLC but haven't used him for anything? I bought DLC for possible guests who would like to play as them. I haven't had any guests for a long time so I did not buy the newer DLC yet. But if they have an interest in SSB$ and want those characters I probably will buy them. Nope, I just accidentally held on to the shift key while capitalizing the letters part of SSB4 and still held on to it when I got to "4" and I had not realized that but that is amusing. It's like people who abbreviate Microsoft as M$. Any PS$ folks out there? Eh? Eh? Nah. No one cares about your bitching dude. More people care than you think!